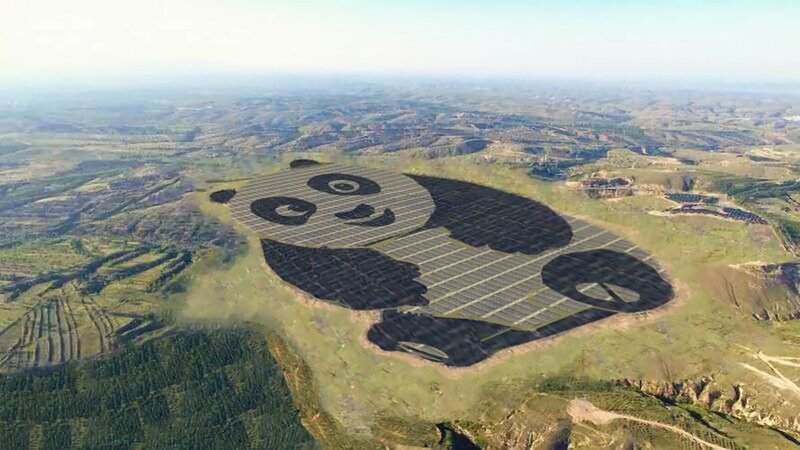 A Chinese solar power company just went overboard and made a huge 100MW solar power grid that looks like a panda. The company that made this stunt possible, Panda Green Energy mentioned that they have connected 50MW of power from this grid on June 29. The picture which now went viral is not the actual picture, but a conceptual rendering of the project. You can see the actual image taken by a drone below. While the actual plant isn’t quite as vivid as the sketch, it is nonetheless a significant addition to China’s solar fleet. According to the company, the new plant will avert the need to burn 1 million tons of coal over the next 25 years. The plant was first proposed in May 2016 by China Merchants New Energy, Panda Green Energy’s largest shareholder, and was announced in September as part of a project with the United Nations Development Program to engage more youth in sustainable development issues. The Panda Power Plant initiative was also incorporated earlier this year into the “Belt and Road” initiative, China’s ambitious plan to invest in development projects in countries along the old Silk Road. The new plant in Datong is expected to be the first of 100 plants in the shape of pandas and other animals to be built in China and elsewhere as part of that effort. Another one, in Fiji, was announced in May. The new Panda Power Plant is also just the latest showy example of China’s commitment to scaling up solar and other forms of renewable energy while cleaning up coal before eventually phasing it out. Unlike the US, China is on track to exceed its Paris carbon reduction commitments, as Vox’s David Roberts has reported.